Our mission and vision speak to our commitment to supporting and transforming systems so that all students—and particularly low-income students and students of color—can be successful in college, career and life. We recognize that, in order to get there, we must look closely at ourselves—both as individuals and as an organization—to ensure that we are doing everything we can to dismantle systemic inequities. Over the last several years, we have implemented and significantly resourced an internal Race, Inclusion, Diversity and Equity (RIDE) strategy. Our RIDE efforts are intended to build our individual staff and organizational capacity and credibility to lead on issues of equity and increase diversity, equity and inclusion at all levels of the organization. Increased staff and leadership diversity. 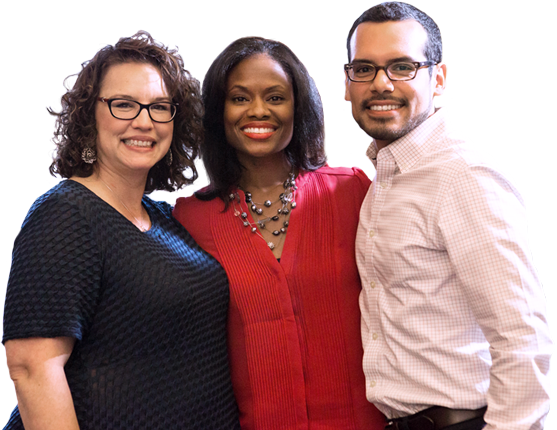 Today nearly 40 percent of our team members identify as people of color, up from just 15 percent in 2013, with leaders of color in all levels of the organization. This is a result of both competency-based promotions and diversity hiring principles, including our commitment to creating diverse hiring pools for all positions—even if it that sometimes means leaving positions vacant for an extended period of time. Education First is also a majority woman-owned business. Our senior leaders are not as diverse as the overall staff, and we are actively developing talent pipelines to increase the diversity and representation of our executive leadership. Learning from data. Education First established our baseline data to understand our staff trust, respect, and understanding of RIDE issues through the Fellowship for Race and Equity In Education’s diagnostic survey and interviews conducted in spring 2017. In December 2017, we participated in Promise54’s benchmarking survey for education reform support organizations. In the Promise54 survey, Education First ranks highly on inclusion and equity, and lower on diversity. We use these data to inform our RIDE offerings and requirements, and we are committed to tracking our improvement every year against these baseline data. Mandatory RIDE professional development. At both biannual in-person retreats and multiple times per month, staff participate in professional development on topics in support of organization-wide learning goals, which were informed by data and set by our RIDE team. Topics have included micro-aggressions, critical race-consciousness and how to be an effective ally. There are also many voluntary opportunities for learning, discussion and growth, such as our RIDE Book Club; affinity groups organized by race, gender and individuals who identify as LGBTQ+; formal “thought partnering” sessions with colleagues who are addressing challenges with race, inclusion, diversity or equity on their projects; and Immunity to Change cohorts, which focus on identifying personal goals for growth and partnering with colleagues for support through the process. Incorporating RIDE into organizational structures. We have formally incorporated a focus on RIDE in our project delivery approach, which means teams are learning to discuss issues of race, inclusion, diversity and equity with potential and current clients, throughout a project. We are updating our staff competency model to ensure that our expectations for performance and performance review processes include RIDE skills and actions. A working group using the Equity by Design framework is developing and testing solutions to increase equity and inclusion in our projects and talent systems. Public statements. In the past several months, our Partners released statements on both Charlottesville and the repeal of DACA, shared our RIDE efforts with the field and also provided a platform for staff to share their thoughts on RIDE-related issues, including the difference between equity and equality, the importance of educators in responding to crisis, and why DACA is so important for students. Additionally, we strive to connect our work in social and emotional learning to an equity agenda, as described in this blog post. You can read more of our reflections on RIDE here. In summary, we believe we have an obligation to apply our expertise and services to dismantle systemic inequities. We have much to learn and more changes to make. Through our work with educators and leaders in nearly 40 states and 25 large school systems, all of whom are committed to improving opportunities for underserved students, as well as our internal RIDE work, we are moving in the right direction.